Randy Seaver likes to play games. He’s good at urging us to examine our ancestors with his Saturday Night Genealogy Fun. So I’m a bit tardy. Who’s keeping track? The idea was to calculate a random ancestor on your ahnentafel chart, so Randy calls it roulette. Ahnentafels are basically a pedigree system with a number for each direct ancestor. I cheated because the chart I’m consulting starts with my Dad instead of me so it’s all Scottish. Plunging right ahead, my Dad would be 113 if he were alive today. Divide by 4 and round off. Let’s see, that must be 28.25. Rounded off Randy’s way, that makes it 29. An odd number guarantees it’s gonna be a female ancestor. Say hello to my no. 29, Jessie McKenzie. Let’s not confuse her with my no. 13, Jessie McKenzie. Yes ... SIGH ... on top of too many John Frasers and Donald McFadyens, apparently I have two Jessie McKenzies. I probably have several Flora McLeans as well. Others with Scottish heritage probably share my desperate pining for an occasional Cassandra or Hortense to alleviate the pain. That takes care of Randy’s first two tasks. Next up is tell us three facts about this person. (1) Jessie was born 20 April 1782. (2) Her place of birth was Dornoch in Sutherlandshire. (3) She married Donald Campbell (oops, I see more than one Donald Campbell, damn!). Whew, I made it, three for three. And how do I know all that information? Brilliant research on my part? Not exactly. My delightful cousin Madaline did all this work in her epic Our Campbell Legacy. It's so large I confess I haven't read every page yet. In what remains of my lifetime, I will never achieve what Madaline has accomplished. Fortune smiles on me that we share a lineage making us 4th cousins who have never even met each other in person. I’m hereby writing this down about Jessie to fulfill Randy’s fourth requirement. Jessie and her husband Donald Campbell came to Cape Breton in 1817, probably on the ship Frances Ann among Rev. Norman McLeod’s followers. They settled on a land grant at St. George’s Channel (on Lake Bras d’Or) in a community that became known as Points West Bay in Richmond County. Their dates of death and place of burial are unknown and forgotten now. Perhaps I will have enough for a Campbells Part 2 one day, but I hope to have given Madaline a live hug by then! Information in the Land Register of Quebec (Registre Foncier du Québec) has been largely untapped by genealogists. Sharon Callaghan recently authored two articles in Connections, the quarterly journal of the Quebec Family History Society—vol. 30, no. 3 (2008) and vol. 31, no. 1 (2009). Sharon penetrated, for family historians, the complexities of the province’s rather unique history of land ownership and methods of accessing the documentation. The Quebec Family History Society was formed in 1977 and I’ve been a member of QFHS since early days (no. 273). Sharon and fellow member Gary Schroder decided to work out some “real life” examples of land registry tracing. My ancestor John Fraser the farmer became a guinea pig. Not my John Fraser the blacksmith. John the farmer had lived on the River Rouge Road outside St Andrews, Quebec (St-André Est) since 1806. In order to keep this post to a readable length, I’m merely introducing the Land Register of Quebec. It's a learning exercise for me, because it’s not a particularly easy subject to follow. My Fraser news and documentation, some of it still to come, will have to wait until Part 9. How would a family historian find the history of occupancy and transactions on an individual property in the province of Quebec? To compare, most of my experience is with historical Ontario land records (say pre-1950). Once you know the name of a rural township with a concession and lot number, you consult the abstract index to deeds for that property. The abstract index is a short-form outline of all registered transactions on that piece of land dating from its original Crown land patent (title deed). Created in county and district land registry offices, southern Ontario abstract indexes were microfilmed by the Genealogical Society of Utah in the 1960s. Thus, they can be viewed at LDS Family History Centers, at the Archives of Ontario in Toronto, or at various smaller archives with selected film copies. Urban properties established in old town plans or subdivisions require somewhat more effort to trace back from a modern address. Quebec, on the other hand, has a history of French seigneurial land grants, abolished in 1854, which overlapped with the English township land division dating from the 1760s. The present Quebec cadastral system evolved with new surveys from the 1860s and completed in the 1890s. The surveys had to take existing properties into account, but allocated new numbers for them within each cadastre or district. The key is to identify the relevant cadastre (current land division) of the ancestral residence, and then sleuth with maps, surveys, directories, atlases, and every other possible source to determine a cadastral number for urban or rural land. Municipal offices can assist with if you know a street address. Cadastral numbers are not the same as previous lot numbers, if indeed there had been a prior lot number. Armed with this special number and presenting yourself at the appropriate land registry office, you’ll be able to access the land register for the relevant property (similar to the abstract indexes mentioned above). The references (actes) in the register can include deeds, surveys, wills, and other notarial records going back to the lot’s cadastral establishment. One lot may require searching more than one number. The land registers began in the 1830s as land offices were set up. Sharon rightly celebrates that this is another way to find genealogically-rich but often elusive notarial documents. An alternative, if you’ve found the required number(s), is to use the fee-based online database leading to the land register ... if you feel comfortable with the French language. The actes have now been digitized as far back as the oldest cadastre system. You can order a copy of any act from the register no matter its date. See full information on the Natural Resources website. Before I even fully grasp the handle of this newly opened door, I’m asking, what about pre-1830 records? Ahhh ... think seigneurial document collections! ... a different ball game. The possibilities expand. "Berkeley Castle" Photograph by BDM 2009. But long before the mid-1800s, I want to go back to when the Town of York was conceived and born. I’m not a historian or an archaeologist, but I have a story. In 1793 Governor Simcoe selected a new capital for Upper Canada at Toronto Harbour. A muddy little town called York would spring up forthwith. Mind you, parliament was not in session here until 1795. Many officials were reluctant to move from their comfort at Newark (Niagara-on-the-Lake). The parliament buildings, aka Government House, were not completely finished until 1798. Their predominant site was on the east side of Berkeley Street, south of Front (once called Palace) Street. In the 1790s, Berkeley Street was the eastern town boundary. Meanwhile, a number of plans and surveys existed for the town which occasioned plenty of angst among would-be residents and officers of the Crown. The governor’s office and the land committee were swamped with petitions for building lots and larger estates. Everyone wanted a prime location. Building contractors, carpenters and masons were in great demand from day one. Some properties were being claimed, and structures were being built, before land titles could be confirmed. Enter John Small (1746-1831), clerk of Simcoe’s executive council, coming to York to take up his duties—John Small of the infamous 1800 duel which resulted in the death of the attorney-general and overshadowed his entire career (see Dictionary of Canadian Biography). On his arrival, Small decided the perfect spot for his new home was on Lot 1, First Block. He would be mere moments away from his work at Government House. But George Porter had already claimed it. The two men resolved Porter’s prior claim with Small buying him out on 31 August 1795 for $50 and a promise of completing the shingling. (3) They probably knew each other from their neighbouring town lot claims in Newark. Small would live in the house while planning his grand estate, intending for Porter’s house to become his eventual stable. A lot of things never went smoothly for Small, a bureaucrat whose “work was soon badly in arrears.”(4) It must have been doubly aggravating for him, as the governor’s clerk and a permanent resident, that ownership and title for Town of York land grants often bogged down over conflicting claims—whose name was properly entered for which property by which surveyor or government official. Some lots, like Porter’s, had been allocated by surveyor Alexander Aitken before Simcoe requested surveyor David Smith to make another plan. By 1805 Small was still trying to establish title to his desirable property whereon he had “his Cellar dug and the Frame for his House brought there 70 by 26 feet and the greatest part of it put together.”(5) Small stated Simcoe himself had initiated the delay for fear Small’s grand house would detract from the parliament building view. Actually, a government reserve had been declared early, perhaps another example of shifting survey boundaries, which may or may not have affected Small’s location. Nevertheless, apparently he eventually clarified his title and built his home. Town of York, November 1813, from "Sketch of the Ground in Advance and including York, Upper Canada," by George Williams, Library and Archives Canada; as seen in The Town of York, 1793-1815 by Edith Firth, opposite p. lxxxi. With trepidations from an amateur, some discrepancies are noted regarding site locations and other matters, although John Small was not my target interest and each and every known map of old York has not been investigated. I invite comments on the discrepancies. Small’s home can be seen marked in teal (where I think it is) on the 1813 map of York. The location agrees with both Scadding(6) and Robertson(7), writing later in the nineteenth century, who say Small’s house was on King Street, i.e. facing King rather than Front. That makes sense if he modified his plan so as not to “interfere” with the Government House view. And also probably because Porter’s more modest house occupied a different part of the lot. By now it seems Small had acquired more than one lot in the First Block. But where exactly was Small’s stable, once George Porter’s house? Enquiring descendants would like to know. Porter’s house could be any of the other buildings shown on the block, but (discrepancy) Firth says the log house was located on the southwest corner of King and Ontario Streets, which would place it in the Second Block. (8) Scadding provides information about Small’s original home, referring to a plan of the grounds. (9) I wonder where that “plan” is now, and what was its date?! The house had a “central portion and two-gable wings somewhat after the fashion of many an old country manor house in England. ... It was one of the earliest domestic erections in York [c. 1794]. When reconstructed at a subsequent period, Mr. Charles Small preserved, in the enlarged and elevated building now known as Berkeley House, the shape and even a portion of the inner substance of the original structure.” Charles Coxwell Small was a son of John Small. Scadding was a bit premature on his completion date (discrepancy), since Small was still facing a partially constructed building in December 1805. Part of fold-out (1842) map in frontispiece of Toronto of Old by Henry Scadding. So what we see on the 1842 map is a different outline of Small’s house (another discrepancy? )—it now appears to be set back from King Street. We can see the extensive orchards on the south side of Front Street where “Berkeley Castle” now stands. By then the son Charles had effected his renovations and presumably had acquired the water lot south of Front. John Small had a son and a grandson named Joseph Small, neither of whom was a mayor of Toronto (discrepancy) according to a List of Mayors of Toronto but some descendants did become involved in public service and politics. Landfill at the shoreline began in the 1830s and we can see here how the esplanade was being shaped south of the orchard. On the east, the parliament buildings have disappeared, having been burnt down in 1813 during the American invasion. The Small home was demolished in 1925. My friend George Porter remained in York for a few years, attempting like so many others to acquire additional land grants like his more influential contemporaries. George disappeared suddenly in 1799, leaving a small family in his wake. And leaving scads of questions about his widow’s life after 1799 until about 1823 and where his children were in the interim! Now that’s what I call a mystery. 1. J.G. Chewett, “Plan of the Town of York, Corrected, 1827,”digital image, NMC 16819, University of Toronto Map & Data Library (http://prod.library.utoronto.ca:8090/maplib/digital/NMC16819.jpg : accessed 4 September 2009). 2. Christine Mosser, ed., York, Upper Canada, Minutes of Town Meetings and Lists of Inhabitants, 1793-1823 (Toronto: Metropolitan Library Board, 1984), 21. 3. Upper Canada Land Book F, pp. 359-361 (1805); Library and Archives Canada microfilm C-102. The entry includes copies of Small’s petitions in 1800 and 1801. Edith Firth in The Town of York 1793-1815 adds the details of the price. 4. S.R. Mealing, “John Small,” Dictionary of Canadian Biography, Vol.VI, 1821-1835 (http://www.biographi.ca/ : accessed 6 March 2009). 5. Land Book F, pp. 359-361. 6. Henry Scadding, Chapter 6, "King Street: George Street to the Bridge and Across It," Toronto of Old (1873; reprint Toronto: Dundurn Press, 1987). pp 137-138. Also available on Google Books (http://books.google.ca/). 7. John Ross Robertson, Landmarks of Toronto, Vol. 3 (1898; reprint Belleville, ON: Mika Publishing, 1974), insert p. 95 and p. 96. 8. Edith Firth, The Town of York, 1793-1815 (Toronto: Champlain Society/University of Toronto Press, 1962), 223; citing Ridout Papers at Archives of Ontario. I know, I’m neglecting the Dougalls and Frasers. Best to concentrate on one project at a time, to get the maximum effort into the story and the mechanics. Strike while the iron’s hot. Stop delaying and dallying with dreamy thoughts that a visit to the Isle of Coll is in my future and will somehow fuse everything together. Just because I saw the McFadyen homestead in River Denys (Cape Breton), doesn’t mean I’ll find a heap of stones in Scotland where my ancestors once lived barefoot and ate turnips. It doesn’t mean I’ll have a huge epiphany or a sea change or something. As I understand it, tourists often fail to grasp local colloquialisms, so they miss the healthy humour of today’s Collachs. Who, by some reports, tend to party away half the night. This is how they raise money for a new community centre so they can have bigger parties. I'd never get any rest if I went. 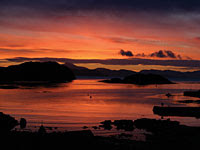 Photograph "Arinagour Sunrise," Welcome to Coll (http://www.visitcoll.co.uk/wallpapers.php?g=1&w=1024&h=768). This is what happy Collachs see on their way home after a successful ceilidh. But I digress. This was supposed to be about my resolve to shape up my McFadyen family history (Ancestors and Descendants of Donald McFADYEN and Flory McLEAN from the Isle of Coll, Scotland, to River Denys, Nova Scotia). The cards are on the table and the iron is in the fire. I confess: I’m a manual, word-processing, do-it-yourself family history writer. The shaping up means checking every footnote, about 200 at last count, for proper standards and consistency. Elizabeth Shown Mills’ Evidence Explained is THE guide, not to mention her QuickSheets for citing online sources. A good footnote/citation checker will pay the greatest attention to each note in sequence. A not-so-good checker, like me, will get distracted by each note and start rummaging through files to see if I missed a nugget or go online to search/add more information or start bugging the relatives again. It gets painful when I find myself subscribing to more databases or waiting for new bits from phone calls and postal mail. Discipline is absolutely necessary to stop the straying and go with what I’ve got. Otherwise, as all writers and historians know, the job will never end. We want to research, write and edit forever. And let me tell you, I acknowledge that 200 footnotes are a modest pittance compared to the ambitious projects I see other genealogists undertaking. Sigh. Will anyone in my family ever understand why I’m doing this the way I’m doing it? Then I must check my genealogical numbering system, including all those superscript numbers and when they should be italic or not. My suspicion is that I may have mixed the Register system with the NGSQ system sometimes. You’d think I would have used Numbering Your Genealogy: Basic Systems, Complex Families and International Kin (authors Curran, Crane and Wray, Special Publication no. 64 from NGS, 1999) from the get-go, avoiding this retro situation. Well, this perfect booklet was published way after I’d started my constructing. Too late to wipe it out and start again from scratch. You can take a car on the ferry from Oban to Coll, but why bother when you can rent a bicycle on an island measuring about 3 miles by 12 miles. I’m only seeking a driver from Edinburgh to Oban who won’t kill us driving on the wrong side of the road. Might as well keep the dream alive.